First of all I hope you have enjoyed your holidays. I wish you success, health and prosperity in the New Year. We are grateful for your participation in our traditional news conference. I don’t think I should take too much of your time with my opening remarks. Just recently the President of the Russian Federation held a detailed and long news conference. Several days ago Vladimir Putin also met with heads of Russian media, and news agencies. I am sure you have benn following these major events and have well heard his comments, including those on foreign policy issues. I will briefly say yet again that last year was not easy in the context of foreign policy. There remained numerous hotspots in different parts of the world – from the Middle East and North Africa to our neighbour Ukraine. In the last few months the situation was seriously aggravated by Washington’s threats to resolve the nuclear issue of the Korean Peninsula exclusively by force. Similar threats were made regarding the Afghan issue as they also suggested to address it exclusively by force. Recent statements aimed at undermining the implementation of the Joint Comprehensive Plan of Action on the Iranian nuclear programme did not contribute to optimism and stability, either. To our regret, our American colleagues and their allies still want to operate only on the basis of dictate and ultimatums. They are unwilling to listen to the views of other centres of world politics, to accept the realities of the emerging multipolar world. The methods they resort to in order to restrain their competitors are, for the most part, quite dubious and unfair and their range is extensive – from the deployment of a the global missile defence system to unilateral sanctions, exterritorial application of their own legislation and, as I have already said, threats to resolve any international issues exclusively in line with their own scenario, without stopping at anything, including the use of brutal armed force. As a result, we are witnessing the devaluation of international law, lower role of international institutions and a growing number of countries placing their bets on an building up their military capacities which they see in the current situation as essentially the only guarantee for preserving their sovereignty. In these conditions we do our best to protect, first and foremost, the national interests of the Russian Federation in our work in the international arena, including the interests of our citizens and Russian business that is increasingly subject to discrimination. At the same time we did all we could to defend international law and the international system that are based on the UN Charter. Together with other constructive actors in the international community we upheld the universal values of truth, justice and equitable and mutually respectful cooperation and also tried to prevent the degradation of the world order that is badly out of balance today. We wanted to do everything to halt the descent into chaos and confrontation. We would like to do our best to stop the sliding towards chaos and confrontation. I am ready to comment on specific areas of our work in my answers today. I will just mention that this year we will continue acting in the same vein as I have just described. Naturally, this concerns the continued struggle against terrorism, in which we have achieved success in Syria, which is undergoing a very important stage – the transition to political settlement. In cooperation with our Turkish and Iranian partners we are organising the Syrian National Dialogue Congress that is supposed to be attended by a broad range of Syrian forces, as required by UN Security Council Resolution 2254. We will work to preserve the agreement on the Iranian nuclear programme and normalise the situation around the Palestinian-Israeli settlement process. The unsettled Palestinian issue seriously aggravates the situation in the Middle East. Needless to say, we will continue working on the Ukrainian issue that can only be resolved through the full and consistent implementation of the Package of Measures that was adopted in Minsk in February 2015. We have a very important political event on our agenda –elections of the President of the Russian Federation. Our foreign missions – embassies, consulates general and Russian centres of science and culture – are doing everything necessary to make sure that all Russian citizens abroad who want to take part in the elections can do so in the simplest possible way. 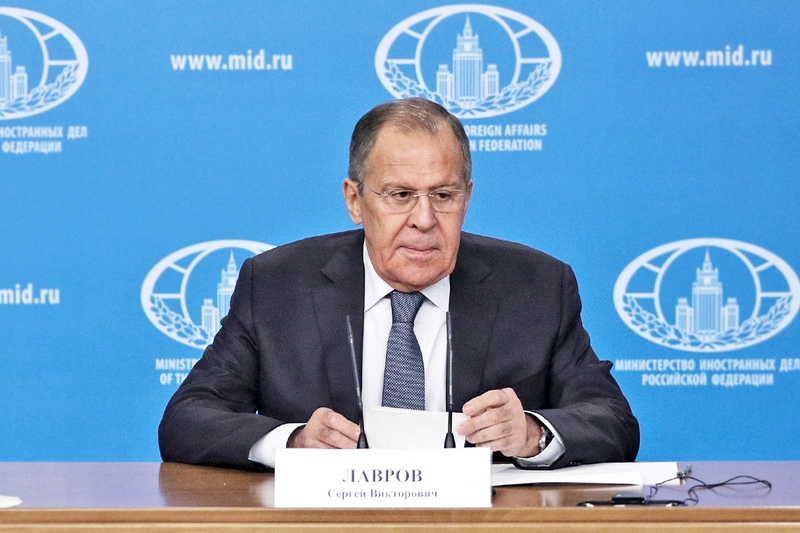 Sergey Lavrov: I will leave the phrases apart as I am afraid to be misinterpreted again. As for the stories, of course, it’s Syria. This issue is a focal point for many interests of many actors. We are trying, as I have said, to use the initiative of convening the Syrian National Dialogue Congress to harmonise the interests of all Syrian parties and all external actors who have influence on the situation and want to secure their interests in this region, including as part of the Syrian settlement. This is a complex process. To reiterate, we have reasons to believe that the pro-active role of Russia, Iran and Turkey will remain unchanged. It made the Astana process possible one year ago, enabled the creating of de-escalation zones, which continue to operate despite individual violations and the attempts to thwart it. It is also important that the Astana process triggered the UN activity, which, prior to the meetings in Astana, remained, in fact, inactive for some ten months. I hope that the initiative of the Syrian National Dialogue Congress will also act as an incentive for the UN to step up its activities. In any case, the Congress in Sochi is aimed at promoting the Geneva talks. We are saying it unambiguously to all our colleagues, including the UN leadership and the countries involved in the Syrian settlement process in one way or another. The second topic, probably, includes everything else that concerns the Middle East and North Africa. The Syrian settlement is only a part of the complex tangle of issues in this region. I will mention Libya and Yemen. I have already mentioned the Palestinian-Israeli settlement process, which has reached an impasse. I remain convinced that the deadlock in the Palestinian-Israeli settlement process, in moving towards creating a Palestinian state has a part to play in radicalising the Arab street. There is another topic - Ukraine, which is artificially inflated to make it look bigger than it is, and is seen as the key issue in the confrontation between Russia and the West in general. I consider this approach to be erroneous and absolutely politicised. If they abandoned the assessment, the prism of confrontation between "authoritarian Russia" and the "liberal West" through which the Ukrainian crisis is being viewed and focused instead on the content of the Minsk Agreements (everything is clearly spelled out there and cannot be to interpreting), then, I think, the Ukraine crisis would have been settled a long time ago. This would mean that rejecting the ideology-driven interpretation of the situation as supposedly having global significance for the relations between Russia and the West would allow our Western colleagues to abandon their thoughtless and reckless support of the policies pursued by official Kiev designed to shirk its commitments under the Minsk Agreements. Much may be said about positive trends as well – there’s no end to such conversations. They include promoting Eurasian integration, implementing the greater Eurasia project with the participation of the EAEU, the SCO, and ASEAN countries, its openness to new participants in the East and the West. Of course, it is also necessary to talk about integration processes on a broader scale - in the Asia-Pacific region, the activities of APEC, the G20, and BRICS. These associations embody major trends of the modern world, namely, the objective emergence of a multipolar system of international relations. I’m sure I have forgotten to mention a thing or two. I was speaking off the cuff about issues that we have on our desks on a daily basis. Question: Before the New Year the leaders of Russia and China announced that they would like to continue cooperating in international affairs. Could you, please, name the main international issues on which Russia may count on effective cooperation with China this year? Sergey Lavrov: I am very glad that you are the second person to be given the floor because you raised a subject that I have not mentioned answering the first question regarding our top issues. Of course, the nuclear problem on the Korean Peninsula is one of the most serious items on the international agenda. Russia and China are actively cooperating on this track. As you may know we have a joint initiative with China on a transition from confrontation to political settlement of the problem that has arisen on the Korean Peninsula. To begin with, we suggest that everybody calm down and freeze all confrontational activities, primarily those linked with military undertakings that may include missile launches, nuclear weapons tests or large-scale exercises that the United States continues to hold in this region with the Republic of Korea and later on also with Japan. When these activities are frozen and a moratorium on hostile, confrontational steps enters in force, we will actively support direct contacts between the main stakeholders. Speaking about the nuclear issue, these are primarily Pyongyang and Washington but we will be ready to accompany their bilateral dialogue also in the framework of the “six-party process” with the participation of Russia, China, Japan and the Republic of Korea. This is probably the most important issue on the bilateral agenda that Russia and China are now working to resolve. I must say that it is a tough issue to work on.. I have already said that the United States is almost openly talking about the inevitability of a military solution although everyone understands the disastrous consequences of such a venture. The situations favourable to transition to dialogue were followed in the vast majority of cases by provocative actions such as increasingly large-scale military exercises undertaken next to North Korea which provoked another round of tensions. We have a joint roadmap with China and we will actively promote it. We are also cooperating on the issue of the Syrian settlement. Our Chinese colleagues share the stance of the Russian Federation. I am referring to the need for an exclusively political settlement on the basis of the resolutions of the UN Security Council, which provide for political dialogue without preconditions and with the participation of the full spectrum of Syrian society – both the Government and all key elements of the opposition representing the diversity of political, ethnic and religious groups in Syria. We have one more highly important joint initiative with China on the draft treaty on the non-deployment of weapons in outer space. It was submitted at the UN Disarmament Conference several years ago. To our regret, this treaty has not yet been discussed due to the US position. All other countries understand the urgency of this problem but the United States continues nurturing plans to militarise outer space, i.e. to deploy weapons in outer space, which will, naturally, have very adverse consequences for problems of international security. And by the way, speaking about the Disarmament Conference, China is our co-sponsor in the drafting of another major document – the convention on the suppression of acts of chemical and biological terrorism. This draft is also being hindered by the United States, much to my surprise. As for Eurasia, an intensive process of consolidating integration efforts is underway. China has the One Belt One Road initiative. President of Russia Vladimir Putin and President of China Xi Jinping agreed to work towards combining Eurasian integration and the One Belt One Road initiative. The members of the Eurasian Economic Union (EAEU) are elaborating a treaty on trade and economic cooperation with China. In parallel, the EAEU and the SCO are maintaining contacts that, as I have already said, the ASEAN countries are welcome to join. A number of the ASEAN countries have already signed free trade area agreements with the EAEU or are negotiating them. What President Vladimir Putin called “the greater Eurasia project” is a very promising initiative. Needless to say, it will be necessary to take into account a large number of specific factors because too many economic interests overlap at this point. This is a strong initiative because it is based on reality. It is not being implemented via the initial formation of some framework and subsequent transition to practical action. Here is an illuminating example: pavement being laid in lawns in England. They first look where it is convenient for people to walk and then put down concrete or pave. Our processes that we call by the common name of the “greater Eurasia project” are proceeding in the same way. I could probably spend a long time listing the joint initiatives that Russia and China are promoting in the international arena. But for the sake of brevity I would limit myself to highlighting these major issues. Question: In 1998, Russia ratified the Treaty of Friendship and Cooperation with Ukraine. The Russian Foreign Ministry did its best to have the treaty signed. Since 2014, the treaty no longer reflects the reality. What are you going to do about it, given that it is automatically extended for 10 years unless it is terminated? Will the treaty be automatically extended or will it be terminated? If there is no decision as yet, what would you advise your leadership to do as an expert on international affairs? Sergey Lavrov: How can I advise anyone on this if I do not know what advice I should give? State Duma Deputy Konstantin Zatulin brought up this subject in public just the other day. He noted that one of the treaty’s key articles, the one about the mutual respect of Russia and Ukraine’s territorial integrity, was irrelevant now after the free expression of Crimeans’ will. By virtue of their referendum people in Crimea gained independence and joined the Russian Federation of their own free will. You know, this does not sound relevant to me. International legal documents are important but these matters are handled by legal experts. I believe that at a political level we continue to respect the territorial integrity of Ukraine within the boundaries that took shape after the referendum in Crimea and its reunification with the Russian Federation. We have many times answered legal questions, including those about the 1994 Budapest Memorandum, which was also recently brought up. Under this memorandum, Ukraine gives up its nuclear weapons while Russia, the United States and Britain pledged not to use nuclear weapons against Ukraine. Let me remind you that we neither used nor threatened to use nuclear weapons against Ukraine, so there was no violation of the Budapest Memorandum. At the same time Ukraine reaffirmed in a separate statement its commitment not to stir up anti-Russian, neo-Nazi and xenophobic sentiments. What happened after Maidan was a flagrant violation of these obligations by our Ukrainian neighbours. I assure you that, in political terms, we are interested in that, as Russian President Vladimir Putin has recently repeated yet again, the Minsk Agreements are implemented in full, without any exceptions. This fits in with our position based on full respect for the sovereignty and territorial integrity of Ukraine within the existing borders that took shape after the referendum in Crimea, which was held in full compliance with international law. Question: The treaty refers to the borders that existed in 1998. Is it necessary to adopt an updated document? Sergey Lavrov: The topic that you are touching upon is diverting our attention away from the essence of the issue. The real matter here is that Ukraine signed the Minsk Agreements, which have nothing to do with the Crimea issue. These agreements must be implemented. If now instead of making the Ukrainian leaders do, at last, what they promised to do and what was later formalised in a UN Security Council decision, we start mulling over how this or that line of the treaty should be read, we, as it seems to me, will only give them an excuse to further delay the fulfilment of this very important document, which, I would like to point out once again, was unanimously approved by the UN Security Council. Our Western colleagues in both Europe and the United States – we know this from our talks with them – fully understand the tactics of the incumbent Ukrainian leaders regarding the Minsk Agreements. They are well aware that our Ukrainian neighbours are still trying to provoke the use of force in this stand-off in order to divert attention away from the fact they are deliberately sabotaging the Minsk Package of Measures. Let us not talk about abstract matters now – I do not want this to be seen as a lack of respect for international law. Utter disregard for it was demonstrated by those who incited, organised and supported Maidan. After all, I will remind you that in February 2014, the then Ukrainian president, Viktor Yanukovych, and the opposition leaders reached an agreement, which was certified by the foreign ministers of Germany, Poland and France. A day later the opposition scrapped the agreement. It turns out that those who on behalf of the EU signed this agreement have deceived the Ukrainian people because the agreement provided for the creation of a government of national accord. But, instead, a “government of the winners”, as it was named by Arseny Yatsenyuk, was formed. Just one day later, if I may refresh your memories, a congress of people’s deputies of the Southeast [of Ukraine] and Crimea was held in Kharkov, with the deputies having been elected in compliance with the Ukrainian Constitution. They decided to take control of their regions until law and order were restored in Ukraine. They did not use any force against the putschists. And on February 23 the putschists approved a language law. Although it was not enacted, its message was clear to everybody – it was an absolutely anti-Russian and, essentially, a Russophobic law. A short time after this, on February 26,the putschists – those who had seized power in Kiev – directly authorised the use of force by the Right Sector, as well as such organisations as Hizb ut-Tahrir and a Wahhabite group to take the Crimean Supreme Council building by storm. Many tend to forget about this now. All this happened within five days of the European grandees’ failure to persuade members of the opposition to deliver what they signed up to on February 20. And all processes were triggered only after that. When the use of force against the Crimean Supreme Council was authorised it immediately became clear that the Crimeans had nothing to do with these illegitimate authorities. This was also a violation of international law, including the Budapest Memorandum I mentioned earlier on, under which Ukraine undertook not to support xenophobic sentiments. We entirely support [the rule of] international law but, first of all, we want all those who initiate the demolition of international legal documents to come to senses and behave accordingly. Question: Last year’s sentiments are reflected in the January poll by the Levada Centre, which shows that 68 per cent of Russians view the United States as hostile country. The figures in the United States are similar: between 64 and 70 per cent of Americans say that Russia is an adversary. Will you, please, comment on these figures that are “sad”, to say the least? Can you also tell us who, or what, is to blame for this situation? Sergey Lavrov: President of Russia Vladimir Putin has spoken on this issue more than once. It is not a matter of which came first, the chicken or the egg, but rather an issue of mentality. The people in the United States firmly believe that their country is unique. President Barack Obama openly spoke about it on many occasions. President Donald Trump has not used this term, but all actions by the US elite and the country’s activities on the international stage show that they continue to be guided by this perception. It would have been a different matter had they promoted their uniqueness by providing positive examples of fair game and competition. Unfortunately, this is not the case. While the United States and the rest of the so-called historical West are losing the dominant positions they have held for at least five centuries, while new centres of economic growth, financial power and political influence are emerging in the course of objective historical development, while the international system should be adjusted to involve these new centres of power in an equal dialogue and to develop constructive and widely acceptable solutions, the United States resort, regrettably, to illegitimate methods in an attempt to stop the curtailment of its relative role in global politics. The UN Charter is a very important document. It stipulates a set of norms that must be respected. I do not think that this document should be modified, although we do support the ongoing reform of the UN Security Council. The key element of the UN Charter is the provision on the sovereign equality of states, mutual respect and the need to coordinate positions. This provision is obviously not in demand in the United States, especially under the current administration. Whenever US initiatives produce a countermotion, if not resistance, the United States immediately and impatiently threatens to resort to sanctions. There are many examples of this kind. Getting back to your question, the development of a multipolar world order takes a long time. The process has started and will be painful for those who are losing their positions for the simple reason that the global economy develops in cycles. At present, it is not the United States or the West that are leading global growth. Of course, one should get used to it, the process is rather painful, as I have said, but there is no other option. The other way is the one that the United States and some of its allies are trying to apply involving threats, ultimatums and punishment, including the punishment of companies and European businesses, for example, Volkswagen, which allegedly failed to comply with some standards, or other companies for failing to allocate funds to someone. This is being done through the exterritorial application of the US law. To cut a long story short, I believe that this heritage is visible in the actions of both the current US administration and the previous administration of President Obama. Regrettably, this legacy has been preserved despite President Trump’s election promises and has even become more intensive and aggressive in some cases. The actions of the US administration reveal the United States’ fear of fair competition in many areas, such as energy and gas supplies to Europe. I am sure you know about the attempts to replace Russian gas with US LNG, which is much more expensive. The examples in energy include opposing the Nord Stream 2 project, which has been denounced as a politically motivated project that will split Europe and strangle Ukraine. This has been said openly in the United States. They force Europe to abandon the project, although gas delivery to Germany via the Nord Stream 2 is 2,000 kilometres shorter and 30 to 50 per cent cheaper that via Ukraine. I think that sanctions in the defence sector, which have been adopted against Russian military exports and the companies that produce these goods, are clearly designed to prevent the strengthening of our positions to the detriment of American positions on this market. It is an understandable striving, but one should compete fairly rather than threaten developing countries with sanctions if they buy Russian weapons, something that happens more and more frequently. Look at the situation in the media, with which you are familiar. We see attempts to limit competition in the attitude to Russia Today and Sputnik in the United States and France, the deportation of our journalists and the closing of our channels in Moldova, Ukraine, Latvia and several other countries. Or take the recent initiative of President of France Emmanuel Macron to suggest some rules for fighting fake news where only one party will decide if a piece of news is fake. It does not provide for any discussions, evidence or arguments, or at least they are not stipulated in the initiative that has been made public. And lastly, take sports and the situation in this area in light of the upcoming Olympic Games and the decisions regarding Russian athletes. There is no doubt, as President Putin has said, there are facts showing that some of our athletes used doping substances, but no national team has ever been collectively banned from the games before. In addition to a desire to hurt Russia in some way, I also think that it demonstrates fear of fair competition. It is obvious that Russian society take note and analyse media reports on Russian-US relations and the United States – I have cited some examples of such reports made in the print media, on television and online. Public opinion is an important indicator. However, I believe that the main contribution to this situation is made by the US administration, which is demonising Russia. We have to respond to the hostile actions I have mentioned. We try to do this carefully rather than by retaliating with “an eye for an eye and a tooth for a tooth.” We cannot tolerate absolutely illegal actions (I have not mentioned the unprecedented seizure of diplomatic property: we have completed preparations for launching legal proceedings). We have to react to them and to write about this, just as you are doing. Since our viewers, readers and social media users take note of the facts I have mentioned (there are many more such facts), I do not know how we can convince the Russian people to respond to a question about their attitude to the United States by saying that the US is the best country in the world and they want the same in Russia. Well, it will be the end of my answer. Question: What is your view of the eight rounds of the intra-Syrian talks in Astana and the talks in Geneva? Sergey Lavrov: The Astana peace process is being covered by the media quite thoroughly. As I have already said, we began the talks after the Obama administration failed to deliver on its obligation to separate the US-controlled opposition from Jabhat al-Nusra and other terrorists. That agreement was reached by President Putin and President Obama after their meeting in China in September 2016. Later, US Secretary of State John Kerry and I formalised it on paper. The Americans could not fulfil it because they were either incapable or unwilling to really suppress Jabhat al-Nusra. Our suspicions remain valid and we are getting more ground to have them. The United Nations stood idle at the time. Turkey, Iran and Russia decided to begin a process that would be based on the actual situation on the ground rather than on abstract schemes. We started working with the armed opposition and the Syrian Government, who later met in Astana for several rounds of talks. Four de-escalation zones became the provisional outcome of the talks. One of the zones was created with the involvement of Russia, the United States and Jordan. The level of violence in those zones has significantly decreased. Right now, however, provocateurs are trying to shatter the situation in Idlib and East Ghouta. The groups in Idlib who signed the agreement on behalf of the opposition and who are being controlled by our Turkish counterparts are subject to some additional external influence, as I understand it. Just recently, they carried out several raids against the Syrian troops. At the same time, there have been provocations against our base in Khmeimim. We could not but respond as those acts were direct violations of the de-escalation agreement. Our western counterparts’ current attempts to make it look like it was the Syrian army that breached the agreement are dishonest. The situation was absolutely the reverse. We do rely on our Turkish partners to finish establishing the remaining observation points around the de-escalation zone in Idlib as soon as possible. They have so far established only three out of twenty. This was discussed during the contacts between our leaders. We were assured that Turkey would accelerate its efforts. I hope this will help stabilise the situation in Idlib and prevent any further disruptions. The situation in East Ghouta is similar. Western media and politicians are trying to make much hype over the Syrian army continuing the operation in East Ghouta despite the agreement on the de-escalation zone. All actions of the Syrian army are responsive because the militants from East Ghouta allegedly close to Jabhat al-Nusra continue to shell residential neighbourhoods in Damascus, including the Russian Embassy area. It would have been absolutely wrong to pretend nothing is happening and not to try to prevent these unlawful actions. But the work continues. The Astana peace process produced agreements regarding additional humanitarian measures, prisoner exchange and a number of other issues that are helping to build up trust on the ground and start a process of nationwide reconciliation based on the de-escalation zones at the local level. The said agreements will be put into practice. We have repeatedly stressed that the Astana peace process is not competing with the UN efforts. There is always a UN representative at the international meetings in Astana. The Syrian National Dialogue Congress (NDC) is also aimed at promoting the talks and not the other way around. UNSC Resolution 2254 states that the talks must involve a government delegation and representatives of as many opposition groups as possible. The Geneva delegation formed by Saudi Arabia with Russia’s support was, in my opinion, not diverse enough and included mostly the external opposition. Those are people who live in Riyadh, Moscow, Cairo, Paris, London, the UAE or Istanbul. The Syrian National Dialogue Congress seeks to involve the opposition based in Syria in the political resolution and peace process, including not only the opposition directly opposing the Government but also the peaceful tribes whose territory has not been shaken by major military activity and who are not technically parties to the conflict but live in that country. Of course, it is important to consider the views of these tribes when making decisions on Syria’s future through its constitution or otherwise. Sergey Lavrov: There are hardly any dramatic differences. Unfortunately, in both cases, what we see is not a desire to help resolve the conflict as soon as possible, but rather to help those who try to make practical steps to change the regime in Syria. I already said that US Secretary of State Rex Tillerson, like John Kerry, has repeatedly assured me that the only purpose of the US presence in Syria, including the Air Force and special forces ‘on the ground,’ together with the coalition, is the destruction of terrorists, including ISIS. Even keeping in mind that ISIS, according to the Americans, has not been completely destroyed, as separate hotbeds and disbanded fighter groups have remained, the actions we observe now show that the US does not really want to preserve Syria’s territorial integrity. A new US initiative was announced only yesterday, allegedly aimed at helping the so-called Syrian Democratic Forces (SDF) to create certain areas of border security. By and large, this means the isolation of a vast territory along the borders with Turkey and Iraq, to the east of the Euphrates. These areas are now controlled by the SDF, but there are complicated relations between the Kurds and the Arabs there. The announcement that this zone will be controlled by US-led groups and forces of up to 30,000 people is a very serious matter, which raises fears that they have taken a course for dividing Syria. This is being done without any reasons arising from the UN Security Council resolutions or earlier reached agreements from the Geneva talks. We, like our Turkish and Iranian colleagues, like many others, I am sure, now expect the US to give detailed explanations. Sergey Lavrov: This is a common area for our work. We are working for a full compliance with the ceasefire agreements. The Kurds are definitely part of the Syrian nation and their interests should be taken into account in the work we are doing, including in the preparations for the NDC. I have mentioned the new US project to build border security forces relying on the SDF which is mostly formed by Kurdish groups. You know that this has already caused a negative reaction from Turkey. I said that this raises serious questions about respect for Syria’s territorial integrity. But there is also a problem when it comes to the relations between the Kurds and Turkey. This new unilateral ultimatum step and project does little to calm down the situation around Afrin. Question: The conflict between Erbil and Baghdad is still going on. Dozens of Kurdish residents have been killed in Kirkuk, and about 200,000 Kurds became refugees. What role may Russia play in resolving the conflict between Erbil and Baghdad? Sergey Lavrov: We have already responded to this situation in detail. We are confident that the Joint Comprehensive Plan of Action (JCPOA) for the Iranian nuclear programme is among the international community’s most important achievements toward stabilising the situation in the Middle East, confirming the unacceptability of undermining the weapons of mass destruction (WMD) non-proliferation regime. Our position has been repeatedly brought to the attention of the United States. Ever since the first doubts were raised in Washington about the expedience of preserving the JCPOA, we, together with the Chinese and European signatories, have repeatedly conveyed to Washington our convictions about the detrimental nature of this step and its unpredictable consequences. Unfortunately, this did not fall on the right ground. So far, our efforts have not been crowned with success. We will continue working to make sure that the US recognises the reality that Iran is fulfilling all its obligations under the JCPOA. This is being regularly verified by the IAEA Director General. The IAEA has not expressed a single concern on the nuclear programme obligations Iran had assumed. Now the US is trying to modify the text of the agreement to include clauses that will be absolutely unacceptable for Iran. We will not support them. Access to any facility on first request is beyond the scope of the agreement, as is the indefinite nature of Iran’s waiver of the rights it has under the NPT and in accordance with the IAEA Statute. At the same time, Iran is being pressured in a broader sense. The US demands that it stop the development of ballistic missiles, which has never been negotiated. Iran has never assumed any such commitments. And in a more abstract way, the US demands that Iran cease interfering in the affairs of neighbouring countries and the region as a whole, and stop violating human rights at home. A whole package of sanctions against that country is being prepared, including for its ‘transgressions’ outside the agreement’s framework. This is quite regrettable. In a few months, there will be another review. If the US really slams the door, I do not even want to think about the consequences. Of course, Iran will no longer consider itself bound by the JCPOA. I very much hope that our European partners, whom the Americans will certainly begin to entice to side with them, will adhere to what is written in the JCPOA that was approved by a UN Security Council resolution and is mandatory for execution by all. Sadly, the United States once again gives reason to doubt that it is a state worthy to negotiate with. Speaking of one specific consequence, I have to return to the nuclear problem of the Korean Peninsula. If Kim Jong-un is required to wrap up his nuclear military programme, in exchange for a promise to lift the sanctions, then this is precisely the essence of the agreements between Iran and the international community. If they just put it aside now and tell Iran it should stick to its obligations, and they re-impose the sanctions, put yourselves in North Korea’s shoes. They are promised that sanctions will be lifted in exchange for abandoning its nuclear programme, so they do, but the sanctions are not lifted. Or, on the contrary, an agreement is reached, and then the Americans just say overnight that the US is a ‘man of its word’ – they give their word, then take their word. This is a popular joke. By the way, a meeting on North Korea opens today in Vancouver, called by the Americans and the Canadians, involving the countries that were members of the UN-led coalition during the Korean War of 1950-1953. When we heard about this meeting, we asked why these participants? Greece, Belgium, Colombia and Luxembourg are among them. They were in that coalition. What do they have to do with the efforts to resolve the current problem of the Korean Peninsula? What will they do there? The Americans told us that it was important to expand support for our common efforts, but the agenda is to develop a mechanism for additional pressure on Pyongyang. Just a couple of weeks ago now, another resolution was adopted. Two days later, it was announced that a meeting in Vancouver would be convened. We and China were not invited, but we were told that the meeting would start tonight, January 15, while the main meetings would be held on January 16; and they invited Russia and China to come and join them in the evening to listen to what they had agreed on. You certainly understand that it was unacceptable. We insisted that the UN should not accept the invitations either, as the invitations had been sent to UN representatives as well. A few words about the American diplomacy manners these days. As far as I know, the day before yesterday, there was a briefing at the US Department of State. The spokesperson, who actually talked about the meeting in Vancouver, was asked why China and Russia had not been invited. The answer was evasive, but essentially spokesperson said that Moscow and Beijing had been informed about the preparations for the meeting and that both countries had allegedly supported the effort. These are plain lies. We frankly said that we considered that effort and that meeting harmful. Question: In 2017, Russia made a huge contribution to the Syrian conflict settlement and generally acted as a peacemaker. How successful, in your opinion, was Russian diplomacy in settling other conflicts, specifically one in Nagorno-Karabakh? Are there plans for 2018 regarding the settlement of the conflict? Are there plans to cooperate with Azerbaijan this year? Sergey Lavrov: As far as the Nagorno-Karabakh settlement is concerned, the Russian Federation cannot have any concrete plans to address this problem because it can only be solved by the parties themselves. Russia, along with the United States and France as the three OSCE Minsk Group co-chairs, is doing its best to create conditions for this settlement. In recent years, we have made a real effort to sum up the parties’ positions, identify converging approaches to some or other aspects of this settlement. At the same time we were trying to suggest the compromises that can lead the parties to a common denominator on matters in which they still diverge. This work has been pursued in an intensive and regular manner, including over the past year. The parties have all our proposals, the co-chairs’ proposals (Russia, the US and France share a common stance). The parties know what the co-chairs think, but it is up to them to decide. Of course, we expect some positive momentum from both parties. We are glad that both countries’ presidents and foreign ministers met last year. Representatives of the co-chair countries participated in these processes. I think, it would be important now to take additional steps to further calm down the situation on the line of contact. This would also help a transition to a political settlement. Let me comment generally: this problem cannot be solved once and for all by just one document. We need a stage-by-stage approach reflecting an understanding with regard to what is possible now and defining the ways of working on matters that require additional discussions in order to achieve a final settlement, including defining the status of Nagorno-Karabakh. So, it is up to the parties. As for plans to promote relations with Azerbaijan, let me say that they are based on a most intensive dialogue between the presidents and the foreign ministers. This year, my Azerbaijani colleague and I have exchanged visits; humanitarian events, including a joint humanitarian forum, are held regularly; mutual trade, investment, etc. are growing. This work is carried out naturally and there is no need for any specific documents on how to regulate it. We have intergovernmental commissions in various fields that draw up relevant schedules. We are highly satisfied with our strategic partnership with the Republic of Azerbaijan. My second question is about attempts to disrupt preparations for the Syria National Dialogue Congress. A State Department spokesperson declared the other day that the US was not going to recognise the legitimacy of this platform on a par with Geneva and Astana. Will this statement influence our position? Will we manage to hold this congress as planned, given the huge number of difficulties – I mean differences between the guarantor countries and even greater differences between other international actors, problems with Kurds participation and that of Special Envoy for Syria Staffan de Mistura? Sergey Lavrov: The question about how Russia would behave, if Julian Assange applied for Russian citizenship, is hypothetical. We regard these situations primarily from the humanitarian point of view. This was the case with Edward Snowden, who asked for asylum, which we granted, taking into consideration the consequences with which the charges brought against him were fraught. He lives and works here. His has an absolutely non-conformist position and, as you know, he comments freely on all subjects. I just cannot comment on “what would have happened, if...” Julian Assange is not in the Russian Federation now, but I fully agree that this problem should definitely be solved in one way or another. We understand the actions taken by the Ecuadorian authorities. I hope that all other participants, too, will be guided by common sense, including our British and Swedish colleagues, who seem to be ready to display goodwill and finally resolve this problem. As for our US colleagues’ attitude to the Astana initiatives and the Syria National Dialogue Congress, we invited the Americans and they participated in the Astana meetings, including by sending a State Department representative from Washington on several occasions. I would be glad if the Geneva process led us at full speed towards a settlement. Regrettably, the initial attempt to reduce the Geneva process to talks between the Government and the opposition émigrés, without involving opposition forces from within Syria, was doomed from the start. We attended these meetings, but we constantly said that the UN Security Council resolution, we are referring to again and again, called for the participation of the entire spectrum of Syrian society. People who have been living abroad for years can hardly be regarded as representatives of the entire spectrum. Hence the emergence of the Astana process: people confronting the Government with arms in hand and the Assad Government were brought to the negotiating table to come to terms on a ceasefire and joint moves to support everyday life in these de-escalation zones. In the same way, following the main stage in the fight against ISIS, the Syria National Dialogue Congress is supposed to use this opportunity to start the political process. It is aimed at involving the people not covered by the Geneva structures. And they are a majority, if we speak about the Syrian participants in all these events. We believe the UN will thank us on seeing the results of this congress as we will significantly broaden its capabilities and the number of participants so that the constitutional reform and the subsequent election rules would enjoy support from the entire Syrian people, and not just those who held secret, backstage meetings at the Palace of Nations in Geneva. Sergey Lavrov: Speaking about Libya, we are not playing the key role in the international efforts there. As you know, Prime Minister of the Government of National Accord Fayez al-Sarraj and Commander-in-Chief of the Libyan National Army Khalifa Haftar held a meeting in Paris. They reached some agreements that seemed promising, but failed to gain traction, though. We also welcome the efforts taken by Libya’s neighbours – Algeria, Egypt and Tunisia. We support the energetic efforts by UN Special Envoy Ghassan Salamé, who has put forward an interesting roadmap. The several rounds of talks held under his auspices in Tunisia suggest, to say the least, that the situation is moving in the right direction, even if slowly, including the preparations for the elections. Everyone agrees that it will be a vital stage. As for our relations with the Vatican, they have been rather intensive even before Cardinal Parolin’s visit. President Putin has had meetings with Pope Francis several times. We can report practical results in the area of humanitarian cooperation and exchange of unique exhibitions. An agreement on visa-free regime for the holders of diplomatic passports, which the Vatican described as historical, became effective last year. We also have common interests, including in the context of developments in the Middle East and North Africa. For several years already we have held several conferences together with the Vatican and some of our other colleagues on the protection of Christians in these bloody conflicts on the sidelines of UN and OSCE events. The latest such conference was held on the sidelines of the OSCE Ministerial Council in December 2017. There are many more examples of our prolific relationship with the Vatican. Sergey Lavrov: You know, I think it is up to the historians to decide. The Foreign Ministries, in my view, shall not have a stance on historic facts. The said period was not the best time in our relations. Russia and Finland are on very good terms at present, I think. Did you happen to watch the Valaam film yesterday? I believe President Vladimir Putin clearly said everything, that we are looking forward and value Finland’s role in saving the monastery together with its treasures. I don’t think it would be a good idea if diplomats went down this road and began to argue about who had started shooting first 70 or 80 years ago. Historians, on the other hand, must research this question, without a doubt. Speaking of which, Russia has joint history commissions with many countries. I would not mind if we set up one with Finland. Question: Exactly one year ago I asked you about Western Europe’s reaction to the development of the EAEU. You answered that the reaction is controversial and each country had its own position. Has the attitude shifted? Sergey Lavrov: As for Brussels’ attitude towards the EAEU, it is true, a year ago they did everything to avoid even recognising any functional value of this integration group. Obviously, for political and ideological reasons, just like NATO refuses to recognise the CSTO as an organisation with which NATO could have a dialogue, although there was certain progress at some point. Now the European Union is finally making steps toward accepting the reality and is at least ready to a dialogue between the European Commission and the Eurasian Economic Commission on regulatory issues, even if only technical ones, but at least relevant to the actual transfer of goods and, therefore, hopefully creating a basis for additional actions toward extending cooperation. We can move this way forward taking baby steps which will get bigger as the time goes by. Russia and Uzbekistan have been allies for many years, and this alliance was documented in a treaty. Our relations continue to follow this line. We have noted with satisfaction that in the past year Uzbekistan has been more involved in multilateral events, including within the CIS and the SCO. We welcome this change. Last spring President of Uzbekistan Shavkat Mirziyoyev visited Russia and talked with President Putin about expanding our strategic partnership and alliance. All these aspects reflect the current work of our multilateral structures in the post-Soviet space. So my belief is that our prospects are really quite good. Question: Canada has suggested it might be prepared to be part of peace-keeping mission in Ukraine if the peace-keeping mission involved all of eastern Ukraine whereas I believe Russia’s position is interest just along the contact line. Do you see any way of bridging those two positions? Sergey Lavrov: Our proposal regarding the UN mission to protect the OSCE observers is not limited to its deployment only on the contact line. OSCE observers have a mandate that says they can move, in agreement with the parties, on both sides of the contact line. They regularly visit the self-proclaimed republics in Donetsk and Lugansk up to the border with Russia, where they may be seen as many as twenty times a week. Our proposal is to ensure UN protection for these OSCE observers everywhere they go and patrol, in accordance with their mandate. As for Canada’s interest, it is not a question to be addressed to me. It is up to the conflicting parties to determine the nations involved, in accordance with our proposal and the common UN practices, that is, this needs to be coordinated with Kiev, Donetsk and Lugansk. Question: And I’ll come back to what you said about the North Korea meeting in Vancouver today. Do you think anything productive can come out of that without Russia there? Sergey Lavrov: Russia was not the only country that was not invited; China wasn’t either. With all due respect to those who initiated this, I do not expect anything productive from it; I will be glad if only nothing counterproductive happens. It would already be a good result. But this looks unlikely, because the agenda sounds like “increasing pressure on North Korea”. Question: A question about, giving one’s word and taking it back. You have made multiple references to February 21, 2014, the date the Agreement was signed. So why the medal for the so-called return of Crimea is dated February 20, which was a day before the signing of the Agreement? Question: Last week, President Vladimir Putin said the Russian Federation was ready to return armoured vehicles and ships from Crimea to Ukraine. Mr Putin also said that Russian-Ukrainian relations will improve once the Donbass issue is resolved. How important is it for Russia to preserve those pseudo-state entities in eastern Ukraine? The Minsk Agreements say nothing about the DPR or LPR, which you mention so often. Sergey Lavrov: It refers to some areas of the Donetsk and Lugansk regions. Since this is not a court hearing and I am addressing journalists, I’ll permit myself to speak about events in a descriptive manner. The Minsk Agreements refer to some areas of the Donetsk and Lugansk regions. Speaking about fulfilment of the commitments, one of the first points, after the points on cessation of hostilities and withdrawal of troops, says that direct consultations are to start between the government of Ukraine and representatives of some areas of the Donetsk and Lugansk regions. It refers to direct consultations. Ukraine still claims that it has not made such a commitment and resorts to various configurations designed to show that it is not talking with them, but is talking with Russia, the OSCE, Germany and France. As for the weapons, when it all happened, they started returning them from Crimea at once, as early as in March. When your leaders proclaimed a counter-terrorist operation describing as terrorists those who had never attacked them, we stopped transferring these arms because we realised that they could be used against the people who had categorically rejected the government coup by those who stigmatised the Russian language, those who, like Dmytro Yarosh, said a couple of days after the coup that Russians would never recognise Stepan Bandera and should therefore be driven out of Crimea. Look through his statements. Yarosh was at the time the mouthpiece of Maidan. I am convinced that the people of Crimea had no option but to defend their identity, their multi-national and multi-confessional culture against such thugs. They simply had no choice. In my opinion, there can be no doubt that we are ready and interested in full implementation of the Minsk Agreements. Sergey Lavrov: One should take a philosophical view of what we hear from Poland. We have repeatedly made it clear that we would be ready for the closest possible, mutually beneficial and pragmatic cooperation. We have always had extensive cultural ties, shared many music and film festivals, made reciprocal visits and had joint film productions. That reflected the closeness of ordinary people who are not engaged in politics, but in matters that are more interesting for the grass roots. Unfortunately, you are right. We have been designated as enemies. We are not going to respond the same way although we see that Russophobia is consciously, consistently and massively being spread in Poland as a national idea. The war on monuments, the claim that they have the right to pull down the monuments that are not on the burial sites although the intergovernmental agreement on mutual care of World War II monuments (the Agreement between the Government of the Russian Federation and the Government of the Republic of Poland on Burial Sites and Places of Remembrance of Victims of Wars and Repression of February 22, 1994) clearly states that it covers all the monuments. And there is much else. We see the role Poland is playing within NATO and the European Union in opposing any suggestions concerning a more realistic attitude towards Russia. Let me repeat that we will be ready for a dialogue, but our Polish colleagues must understand that the dialogue can only take place if mutual interests are taken into account, and not through attempts to dictate to us while feeling that the American and other “hawks” in the North Atlantic Alliance are behind them. Sergey Lavrov: As far as I know, only you, that is, Sputnik, plus Russia Today are unwanted at the events held at the Élysée Palace. I can presume that you were largely the cause for this French initiative. Of course, the initiative as it has been set out by President Macron concerns all sources of fake news, and decisions on whether a piece of news is fake will be taken without any exchange of arguments or rational consideration. At least, this is how the situation looks now and this is how the initiative was formulated. The decision will be taken by a court in the absence of the parties concerned. The initiative has an interesting element. We have noted that there the character of a decision on what can or cannot be regarded as fake news is not adversarial. The suggestion is that liberal democracies know which is which. This is not a quotation but the gist of the initiative in the context of the division of states into three types: liberal democracies, non-liberal democracies and authoritarian states. It will be interesting to see how this initiative develops and what practical form it will take. Question: During your meetings with your Belarusian counterpart last year, you spoke a great deal about moving towards mutual recognition of visas. Will you complete this work in time for the FIFA World Cup? Sergey Lavrov: It will, if the matter depends on us. But for the border to become transparent, we need to synchronise our actions, the same as we need to coordinate everything else related to life of people in the Union State. We signed a special agreement on equalising the rights of Belarusian and Russian citizens, so that Belarusians staying at hotels or resorts in Russia and Russians staying at hotels or resorts in Belarus will pay the same price. We still need to coordinate some elements. But overall, we would like to have no border between us, like in the past. But when Russia was facing increased terrorist threats our Belarusian friends announced without any prior notification their decision to approve visa-free entry for short stays for citizens from 80 countries, it resulted in some inconsistent approach because we had visa regimes with many of these countries. We thoroughly analyse visa requests from these countries’ citizens. A situation was created where those who needed a visa to enter Russia could freely enter Belarus and then move to Russia without any verification. This is why we had to do what we did. We have warned everyone that we will have to check all foreigners who want to enter Russia from Belarus. Foreigners travelling from Belarus to Russia by air must use only the airports that have international checkpoints. This is really obvious. Question: At the end of last week, the Russian Foreign Ministry announced that it became aware of the dark PR campaigns the British media are preparing about the 2018 FIFA World Cup Russia. Could you tell us more? Because as journalists of the British mass media we know absolutely nothing about this. Question: As you know, the Sputnik agency has a great information presence in Latin America. We communicate with regional leaders and experts. All of them agree that they want more cooperation with Russia. This is being especially highlighted now that under the current US leadership, the relations between Latin America and the United States are not developing quite well, and they are looking for new partners. There is great interest in cooperation with Russia. Does Russia have an interest in cooperation with Latin America? Could you possibly cite any projects that could illustrate this? We have developed a mechanism for dialogue and partnership with CELAC; eighteen months ago, the CELAC Quartet visited Sochi, where we adopted a major roadmap for the development of partnership. We also have contacts with subregional organisations in the continent, including ALBA, MERCOSUR, the Andean Community and the Central American Integration System, under which we have requested the status of an extra-regional observer. And of course, we have quite developed bilateral relations with all the countries without exception (though the extent is different), but we do maintain dialogue with all of them. Our trade with Latin American countries, if my memory serves me rightly, has already exceeded 10 billion dollars. It mainly involves high-tech products, military technical agreements, space arrangements, including ground support for our GLONASS system, nuclear energy, and much more. In general, I proceed from the fact that a lot has already been done, although there is always room for improvement. We have long term plans for each of these areas. By the way, I should especially emphasise that we also closely cooperate in the UN. We have similar positions with the overwhelming majority of Latin American and Caribbean countries on all key issues within the UN scope. We jointly promote respect for the UN Charter and for the settlement of all disputes by peaceful means. Question: The First Global Forum of Young Diplomats was held in Sochi in October 2017. How do you regard the prospects of this initiative and do you think it is possible or expedient to create a World Association of Diplomats? Sergey Lavrov: I think such a plan exists and it was announced at the First Forum. We would only be glad if it is supported by the young diplomats of the relevant countries. Question: What do you think of the US initiative and intention to hold a meeting between US Secretary of State Rex Tillerson and the foreign ministers of five Central Asian republics of the former Soviet Union in the “5+1” format in one of these countries? Might American activity in the region have an anti-Russian implication? We hear that the US is inclined to abuse this format a bit and to promote the ideas connected with what was known under previous administrations as the Greater Central Asia project. As you may remember, the project was aimed at focusing all the plans involving Central Asia toward the South, towards Afghanistan, while keeping the Russian Federation out of it. I am sure that if this is really the case and if our American colleagues promote these plans at their meetings with our Central Asian friends, they will all see that these attempts are defective as they are prompted by sheer geopolitics rather than by the interests of economic development and the improvement of transport infrastructure. Our approach, which we call the Greater Eurasia project, enshrines the opposite kind of ideology. It is not connected with cutting off someone from some part of the Eurasian continent, but with openness and a gradual advance of integration processes, eventually uniting the Eurasian continent and leaving it open for other partners to join. Sergey Lavrov: We have already commented on the situation connected with Donald Trump’s announcement concerning the transfer of the US Embassy from Tel-Aviv to Jerusalem. We have commented even more frequently and for a longer time on the harm and the risks involved in this impasse in Palestinian-Israeli settlement. We understand very well how the Palestinians feel today. For many years they have been making unilateral concessions, step by step, without getting anything in return. As I have said, they were ready for direct negotiations with the Israelis without pre-conditions. We were ready to host them on Russian territory and to provide a venue for this purpose. So far, however, no contacts without pre-conditions have taken place. In the current situation, I am afraid the chances of such contacts happening tend to zero, which is sad. At the same time, over the past few months we have repeatedly heard that the US is about to unveil “a grand deal” which would put everything in place and please everyone. We have yet to come upon any such document or statement. Having said that, let me stress that we should not give up. We do not want to see a total break in communication between the sides. I very much hope that we will shortly be able to consult with our Quartet partners (along with the US, they include UN and EU) and hold a brainstorm session on what to do next. We shall not let the situation to evolve by itself. I am aware that there are voices in Palestine that call for disbanding the national administration, declaring Palestine an occupied territory and handing to Israel full responsibility for how Palestine lives and functions, how the life support systems work and how people live there. I hope that we will be able to somehow come out of this crisis situation. I repeat, we will consult with our Quartet partners. We are planning, among other things, to have bilateral contacts with the US. Question: In 2017, Russia and Pakistan had intensive contacts on combating terrorism and drug trafficking, plus the issues of Afghanistan as well. What will the situation be like in 2018? What is expected in the relations between Russia and Pakistan? Sergey Lavrov: You were absolutely right to point out how actively we had collaborated in combating terrorism. We are interested in suppressing the terrorist threat that is spreading to the territories of Pakistan and Afghanistan and “spilling over” the Pakistani-Afghan border. The agreement we made on supplying Pakistan with special equipment, such as, first and foremost, helicopters for antiterrorist units, only further confirms the seriousness of our intentions. By the way, with regard to the SCO’s role in fighting radicalism, let me note the important landmark document signed by the SCO leaders last year. I am referring to the Convention on Counteracting Extremism, which has established a highly important framework, including the principle of unacceptability of using terrorist and extremist groups to put pressure on sovereign states. There are plenty of examples of this, as we know, including in Libya, when Muammar Gaddafi was being toppled. These attempts were once made and continue to be made in Syria, too. I believe this Convention to be highly relevant. India and Pakistan are joining it. Apart from the SCO member states, many other countries are also showing an interest in joining the Convention, since it is open to everyone, not just the SCO members. In the next few days, dispute talks will be resumed over the name of Greece's neighbouring country, Former Yugoslav Republic of Macedonia. The Greeks believe that the name "Macedonia" is unfair because the greater part of the ancient state of Macedonia belongs to Greece and that the name “Macedonia” represents a possible territorial claim over Greek territory. Russian officials said in the past that they might revise the name issue should the circumstances change. Can you comment on this? Question: What if circumstances change? Will a new compromise be possible then? Sergey Lavrov: I have spoken about the subject of gas. We see some fear of honest competition in US actions. Since it is unable to compete honestly now, the United States has started using unfair methods of competition and political pressure to force European countries to build the necessary facilities for buying more expensive gas. The choice rests with European countries. We believe that they must be aware of their economic interests. If they are willing to pay more in this situation, then this is their decision. Our projects on the diversification of gas routes to Europe include Nord Stream 2, which I have mentioned, and Turkish Stream, which can be possibly extended to Europe. As of now, we are only building a line for the Turkish consumers. The second line will be built only if we receive irrevocable guarantees by the European Commission that they will not do what they have done to the planned South Stream pipeline towards Bulgaria, which seems to be willing to discuss the possibility of hosting the second line of the Turkish Stream pipeline again. We can do anything if we are a hundred per cent sure that the European Commission will not derail this project. Of course, we are monitoring the discussions that are underway at the European Commission to introduce retroactive rules to hinder the implementation of Nord Stream. It is not done in good faith. I hope that the purely economic nature of this project, as well as the support the leading European energy companies have given this economic and commercial project, will prevent any foul play. As for the resumption of talks and efforts to settle the dispute over the name “Macedonia”, they were not active for a long time and only resumed when the United States decided that Macedonia should be admitted to NATO. Since Greece is a NATO state you don't need any concessions. But Macedonia, which is being encouraged to join NATO, needs them. It is as simple as that. Question: Last year, two Russian citizens, Grigory Tsurkanu and Roman Zabolotny, were captured in Syria. There was video evidence of their capturing. My colleagues from the channel talked to Grigory Tsurkanu’s parents, who sent inquiries to the Russian Foreign Ministry, the Executive Office of the Russian President, the Federal Security Service (FSB) and the Ministry of Defence of Russia. There has been no information on their fate, on what happened after their capturing. Defence Ministry sources suggested informally that, perhaps, access to this information may have been restricted, although, officially, they were not army servicemen. According to one version, they might have been members of a private military company. Do you know anything about these persons? Can you check if the inquiry reached the Foreign Ministry? Is there information on Russians taking part in operations in other countries on contract basis? Sergey Lavrov: There is nothing I can add to what you have said. We know about the inquiries that you have mentioned. We look into the fate of any Russian citizen wherever he or she might be, if we receive information that he or she was either reported missing or got into trouble. The whereabouts of our two citizens whom you have mentioned is unknown. Steps are being taken, above all, by our military, to determine their location, and collect and verify corresponding information. As soon as anything becomes clear, we will readily report this. Question: In May of this year, Japanese Prime Minister Shinzo Abe will visit Russia. Are you planning to visit Japan? What prospects, objectives, possible documents or agreements do you envisage for these meetings? When will the meeting in Tokyo take place – before or after the Russian presidential elections? Sergey Lavrov: Let me start with the good things. Indeed, we expect Prime Minister Shinzo Abe to visit Russia. There is an understanding on a meeting between the foreign ministers ahead of this visit. The timeframe for the ministerial meeting will be determined on the basis of mutual consent at mutually acceptable dates. Now about our concrete plans. Prime Minister Abe and President Putin will certainly consider the implementation of the agreements on joint economic activities on the South Kuril Islands. Five priorities, albeit quite modest, have been outlined, but we hope that some more serious cooperation areas will be added. This is being tackled by specialised joint working groups at the level of deputy foreign ministers. We are pleased to have resumed the “2 + 2” dialogue at the level of foreign and defence ministers. Last December, Chief of Russian General Staff Valery Gerasimov visited Tokyo and Commander-in-Chief of the Russian Land Forces Oleg Salyukov had been there before him. In autumn, the Intergovernmental Commission held a meeting, while at the same time my counterpart, Japanese Foreign Minister Taro Kono, visited Moscow. We held separate talks and now we will decide on a new meeting. Apart from joint economic activities, bilateral economic cooperation has been developing quite well. Japan invests into Russian economy. Japanese banks have extended sizeable credits for Yamal LNG. This is a long-term investment that adds stability to our investment cooperation. Humanitarian cooperation is traditionally in high demand among our peoples, along with annual festivals of Russian culture. Last year, cultural seasons were organised. We are really happy with many areas of our interaction with Japan. We would like to have greater international coordination, which we mentioned during the “2 + 2” meeting. Of course, we would like to see more Japanese independence during discussions of key international matters at international organisations. The ABM problem darkens our relations, let me say this outright. We discussed this issue in detail with our Japanese colleagues and they brought up the same arguments you have mentioned, namely that the Aegis Ashore system, its variant indeed that is deployed in Japan, was different from the systems in South Korea and Europe. We don’t have these details at our disposal. Our data say that the system to be deployed in Japan is based on universal launchers that can use offensive arms. I would reiterate that we are open to dialogue and want the ABM dialogue, which we proposed 11 years ago, to start in the end. We have a number of questions about how this is being done by the United States, so that it would not become yet another serious destabiliser of the international situation. So far, our American colleagues say that we should not worry and that the systems are not directed against us, as they did under both the Obama and Bush administrations. But there is a lot of evidence to the contrary. Question: In 2014, you signed a treaty on the border with Estonia with Estonian Foreign Minister Urmas Paet. In 2015, the first reading for its ratification was held in the Estonian Parliament. You know well that Estonia and Russia agreed that the ratification will take place at the same time in both parliaments. Estonia has been waiting for two years now for the first reading in the State Duma of the Federal Assembly of the Russian Federation. When you had a meeting with Estonian Foreign Minister Marina Kaljurand in New York in 2015 you promised that the State Duma will soon start the process of the ratification. When will this take place? Sergey Lavrov: This question has deeper roots. Back in 2005 we signed this treaty and generally committed ourselves to ratifying it without any politicised reservations. However, the Estonian Parliament ratified it making a reference to the Treaty of Tartu in the resolution on its ratification, which directly meant the preservation of territorial claims to the Russian Federation. This was a violation of the commitment that my Estonian colleague assumed but could not fulfil. We then revoked our signature under this document and said that we would be ready to start talks and sign these documents anew once they revises their package of documents and delete the reference to the Treaty of Tartu,. This is what happened eventually. We signed the treaty and again agreed, as you were right to say, to conduct this process in parallel. But you forgot the main condition – a commitment to ensure a normal non-confrontational atmosphere between our ruling circles. We kept our commitment. We made no attacks against Estonia as we did not before, no matter what treaty we signed or ratified. However, the Estonian Government showed no restraint. On the contrary, its Russophobic rhetoric was running high. We said honestly that in such an atmosphere our society and parliament will simply fail to understand us if we promote this treaty. At the same time I would like to reassure you that the border does exist. I hope the treaty will be ratified one day. Nobody questions the border. But for the treaty to enter into force and for us to live a normal life, it is necessary to stop being one of the three or four main activists in NATO and the European Union, which do all they can to impose unbridled Russophobia on them. I am being open about this. We have very good relations with the Estonian people. Our peoples are friends and communicate well with each other. Apparently, the politicians should be guided by the interests of their own people rather than some immediate considerations that reflect the geopolitical interests of some other states.